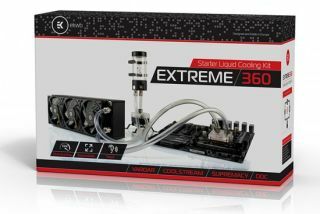 Everything you need to liquid cool your CPU. The many available all-in-one liquid coolers on the market are great gateways into custom water cooling, though making that leap can be intimidating. If you're not yet ready to jump into the deep end but still want to swim past the shallow section, EK Water Blocks (EKWB) offers a few higher end all-in-one kits that only require minor assembly and maintenance. One of them is the EK-KIT X360, which is currently marked down to $300 at Newegg. Some of the parts come pre-assembled to make installation easier, though it's not like a typical AIO liquid cooler with an integrated pump that simply needs to be screwed into place. For the most part, you have to piece this thing together and then install it in your PC. Here is EKWB's unboxing video to get a better idea of what's involved. This kit supports pretty much all modern sockets. However, EKWB warns that the radiator is thick (64mm), so you'll want to make sure you have enough room in your case to accommodate it. If you decide this is the kit for you, go here to grab it on sale.